They were blue and white, and I loved them. It was not just love, it was luuuvvvvvvv. Their narrow vertical stripes alternated. Like a dusty, old record that skips, the blue and white repeated the pattern over and over, encasing each pant leg. The stripes were smaller, maybe 1/4″ in width, not nearly narrow enough to be called pen stripes, but not wide enough to be considered large either. The recently purchased item was a gift, hand-picked and purchased by my mom. That pair was my new-found pride and joy, and I couldn’t wait to wear the pants to school! Bounding off the big yellow school bus and through the school’s large double grey doors, I managed the kids’ version of speed walking. Had I have been allowed to run, I most certainly would have, but running wasn’t permitted. The excitement bubbled as I sped to class. After all, I had new pants to show off! “Did you just get out of jail?” my little friend commented with an innocent snicker. “It looks like you’re wearing jail pants!” he mocked in delight. He had no clue the upheaval his words had created. Butterflies took flight in my stomach as my countenance and shoulders fell. I didn’t want to be known as the girl who wore jail pants. I wanted to be liked and wanted everything about me to be liked. It’s the trap many of us fall prey to. I didn’t want to be made fun of, I desperately wanted to be accepted. Sadly, I failed to recognize that I already was accepted, that I was chosen. Those two simple, little words, jail pants, created an acceptance storm of great magnitude within me. It was the beginning of many storms to come over the years as I grew and desperately attempted to figure out who I was. In my third grade classroom that day, the skies in my little corner of world darkened with intensity. Thunder crashed the skies of my perfectly accepted world. Something about me wasn’t liked, wasn’t perfect, wasn’t accepted. And when we’re not accepted, we’re not chosen. It left me in a tumbled mess. Blue and white striped pants, new or old, weren’t so great after all. In fact, they were an embarrassment in the face of non-acceptance. I couldn’t wait to get home to change them. I never wore those jail pants again. Many of us have our own version of blue and white jail pants. We put them on, one virtual leg at a time, in hopes of finding acceptance. We want to be chosen. To be okay. To be part of the group. I’ve been there with you. Hey, I might have even led the pack at times! Simply put, these means to acceptance aren’t true. You’re already accepted. You’re already chosen. We’re already accepted. We were chosen before our pants, hair, or perceived perfection ever was. Please let that soak in. 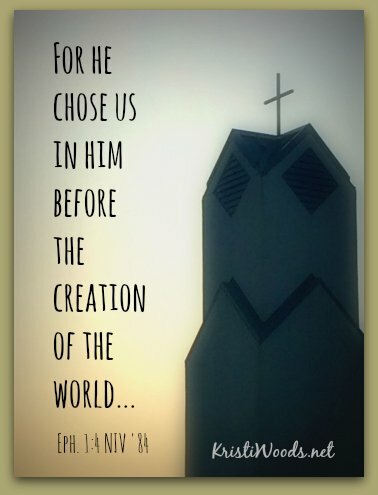 He chose you before the creation of the world. You and I can try as we will, but nothing we do or say will change the fact that “chosen” is stamped all over us. His love blows me over with the acceptance it offers. Only a God of great mercy and love can do what ours has already done. Renew your mind in God’s truth today, my friend. Even as an adult, the pressure to be part of or “like” the crowd is evident, even in Christian circles. Don’t be deceived, don’t fall prey. It’s okay. You have permission to ignore that pressure, that pull. After all, you’re chosen, and that’s all that’s necessary. If you’re searching for a resource to encourage you in the journey of leaving perfection behind and feeling accepted, Holley Gerth’s You’re Loved No Matter What: Freeing Your Heart from the Need to Be Perfect is well worth the read. Oh how true this is. At 59, I still struggle with falling prey to letting negative comments drown the truth. I think we all can, Debbie, if we’re not vigilant. You’re not alone. Keep pressing in to the Truth. He has more than those lies could ever offer. Praise God! Renew! Renew! I’m going to have to shout that to myself, lol. I had a terrible fear of being laughed at or judged and mocked when young… compounded by my childhood dysthymia which can make you second guess everything about yourself when it’s triggered, to the point of panic attacks… and it tries to follow me around to this day. There is so much beauty in you, Christine. Really. By God’s very hand, YOU are a masterpiece. And a masterpiece? It’s something to behold. His work is good. It’s pouring forth from from you in your blog and photography, and I’m sure in day-to-day living as well. I’ll encourage you and you encourage me, okay? We’ll keep our eyes soley on Jesus, the author and perfecter of our faith. Your visits are always a joy. Oh how I can totally relate. All those years of wanting to be liked. Thank you for this sweet reminder that I’ve already been chosen. You’re welcome, Jenny. His word is always a good reminder. 🙂 Thanks for stopping in. You add a beautiful illustration that hits home – all of those times we feel like crawling under a rock, all we have to remember is this remarkable thought. Thank you for the needed reminder! Meeting up with you through #RaRalinkup & Purposeful Faith. Oh girl, no worries on the plug. We’re here to lift up one name, and if it does that…I’m game. Thanks for visiting. Stay tuned because I’ll be heading over to your blog shortly. Kristi, I’ve been there then and sometimes still find myself there … that place of looking to be chosen by those who decide. Those words said in haste by youthful lips still scar my memories today. But we are chosen, and we are free to be who God created us to be. Chosen, yes! As one who has said some of those words in haste, I’m thankful for a God that overcomes them. Your words are sweet as always. I’m a bit partial to the new site as well. Glad you stopped by, Crystal. I’m glad you’re “here” as well, Ellen. Praise God! This is beautiful. I never thought about it from this perspective…that I have already been chosen. Whatever trends I’m trying to keep with, whether it’s fashion, homemaking, or parenting, I was already chosen. Trena, thanks for stopping in. Tie a ribbon around that beautiful finger of yours as a reminder that YOU are chosen. Praise God! I love your new site! How exciting! I am always looking for a way to be in the in crowd. It’s something I am working on with age. God has challenged my heart to a place of contentment this year. A place where I can genuinely and authentically cheer on the women in my life when they experience success. And, a place where I can empathize and pray when they crash and burn. Regardless of where he has for me to be, this is my call for obedience right now. To be faithful in the call of uplifting others and doing so with a cheerful heart of contentment. The truth is, it’s not as hard as I thought it would be. It all stems in the belief that God is God and my identity is in him alone. I’m so thankful for that. It remove so much pressure. Samantha, it’s good to see you here. You are a blessing. I hired a couple of site designers. Didn’t they do a good job?! They were a blessing and joy to work with. I love the challenge God has set before you. I’ve already benefited from it. Thank you. Yes, our identity is in him and him alone. Amen! Hope you’re having a wonderful week, Kristi. Yes, the truth does remain, doesn’t it? Have a wonderful week as well, Lux. Oh the angst we feel when we don’t feel accepted and feel that nothing less will ever be enough. I remember days such as you described so many times growing up but the knowledge that we are enough in God’s eyes is such a gift. God chose each of us and loves us for exactly who we are-that is true love! Thank you for blessing me today. Yes, chosen by a faithful and loving God. It’s good. Thanks for stopping in, Mary. It’s so important for us to know how much God loves us…how He has chosen us and what He has done to draw us to Himself. Thanks for the encouragement today, Kristi! You’re welcome. So glad you stopped in for a visit, Susie. You’re such a good story teller, Kristi! Love the striped pants. This brought back memories of things mom bought that I never wore. Now when my own daughter does this to me, I want to strangle her! (But reading this reminds me of the reasons, and I guess it’s good to go gentle on her.) Yes, it’s wonderful to remember that we are stamped. We’ve been chosen. Love me some good ol’ Ephesians 1 blessings! LoL I love how real you are, Betsy. Yes, I feel the same way when my daughter doesn’t wear what we’ve purchased for her. It’s a good reminder for myself as well! Thank God for Eph. 1. Before I read one word, my first thought as I looked at your picture was, hello pretty girl. I always feel blessed when I see your smiling face. I loved your word picture. I was right there with you! I wanted to pop that little fella for hurting my friend. “It’s okay. You have permission to ignore that pressure, that pull. After all, you’re chosen, and that’s all that’s necessary.” Thanks friend. Blessings on you! Oh.my.goodness! I am bellowing a big ‘ole laugh here at your “pop that little fella” comment. 😀 You’ve written such sweet words, including the encouragement behind the “pop”. I love this friendship birthed by God. Thanks for visiting, Carmen. To be chosen completely changes how I feel about myself. It defines God’s love for me. I can’t even believe he wants me. What an honor. Fabulous story Kristi. Fabulous love. Keep walking in him. Cheering you on from the #RaRalinkup on Purposeful Faith. Isn’t the Lord just the most fabulous part of life?! Your cheerleading always brings me encouragement, Kelly. Thank you for #RaRaLinkup. Just lovely, Kristi – that pressure to fit in and feel accepted is one that can haunt us forever. It’s no wonder we translate that onto God thinking that because He’s the ultimate judge, He judges us too. But oh, His love and grace and acceptance are just second to none and it is such a beautiful thought to mediate on – He chose us and He still chooses us. That makes me want to sigh – thank for the reminder and the beautiful words. Stopping by from #w2w. Yes, they second to none, Tiffany. Second to none. Thanks for neighboring today. Blessings to you. Kristi, your new site looks great! Congrats, friend. 🙂 And oh man, could I relate to this post. My experience that sticks out most was with a bad haircut I had in the first grade. I basically looked like a boy. It was mortifying! I’m so grateful Jesus finally got ahold of me and showed me who I truly was in Him, although I’m certainly still a work in progress. Thanks so much for this. Kristi, that is precious – I want to see a picture of those pants 🙂 Thanks for cheering me on in my faith and reminding me that I am chosen! Isn’t it funny how one little comment can stick with us so deeply and for so long? I’ve had similar things like that happen in my past too. One boy called me “Lassie” in 3rd grade because of my crazy hair (he was right! ha) but I never forgot it. Now I laugh about it, but I sure didn’t back then. Oh, to be not easily offended. It’s a lesson I’m still learning. Can you hear the laughter from here, Lisa? Isn’t it crazy…jail pants, Lassie hair, and so forth…how they leave such a deep impression? I, too, am continuing to learn that lesson. With Jesus vision, navigating the path is much easier. Your visit is always a blessing. Yes, chosen and accepted is what we already are. The world lies and tells us we are not good enough but Jesus has called us His. Yes, Jesus. Thanks for stopping in, Donna. This story brings up a similar experience from my childhood. I had a very large, puffy winter coat. A kid on the school bus would call me “mattress” and it made me feel really insecure! Sometimes I still feel insecure…that is when I need to remember that I’m accepted by the One Most High! Oh Laura…those words others pour upon our heads can dampen our spirits and often our worth. I’m sorry you faced your own version of “jail pants”. However, you’re “right on” when you remember that real acceptance comes directly from the One Most High. And he’s really, really good at it, too. Praise the Lord.